YAMAHA’S R1 may be struggling to compete with Suzuki’s GSX-R1000 on the road, but there is somewhere it will give the new class leader a sound thrashing – on water. The new Yamaha WaveRunner FX140 uses the same 1000cc five-valve per cylinder engine as the Superbike but with a few important changes. The motor gives a clue as to what next years R1 engine will look like as it uses fuel injection, something that sources in Japan have confirmed will be on the 2002 bike. Producing 140bhp the motor produces less power than the current R1 bike’s 150bhp, but has almost certainly been de-tuned for more midrange power. The road going version is sure to produce power closer to the GSX-R’s 160bhp. 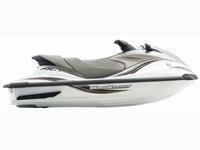 Built to meet strict U.S. emission laws Yamaha claim the WaveRunner’s broad spread of power makes it the perfect tool for towing water skiers or wakeboarders. Although if the thought of being towed by an R1-engined watercraft fills you with dread there is room for three people to sit on the craft in comfort. Expected to arrive in the UK early 2002, the same time as the new R1, the FX140 will be available through Yamaha dealerships. As yet no price has been set for the ultimate water transport. Win Rossi's TT Yamaha R1!